Your first responsibility as a pet owner is to provide your new kitten with all the materials it will need to start his or her new life. This includes making sure your kitten has a nice and warm place to sleep, litter boxes, food and water dishes, a healthy diet, and some toys. 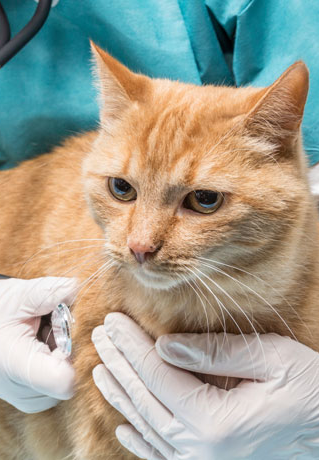 It is also important to plan an early visit to the veterinarian in order to check on his or her general wellness and to schedule the necessary vaccinations. Our clinic prides itself on making your new kitten’s first examination as stress-free as possible. At the initial visit the doctor will address any concerns you may have, as well as educate you on vaccination programs and the best time to spay or neuter them. Early training using patience and consistency is the kitten care you should provide to raise a well-behaved cat that is litter trained, social, and responsive to his or her name. With a little help from you, they will soon know what to expect in your home and how to behave. Make sure your kitten can climb over the sides of the box easily. Most commercial litter boxes are designed to be used by all cats, including young kittens. Put the litter box where it is easy for him or her to reach, perhaps near their bed, and out of the way of the humans who live there. Put your kitten into the litter box after he or she wakes up in the morning, and after each meal, nap, and before bed at night. When your kitten is still learning and has an accident, don’t get upset. Instead immediately pick the kitten up and put him or her in the box. Reward or praise your kitten whenever he or she uses the litter box correctly. Because kittens are usually fussy about odor, keep the litter clean by scooping it daily and replacing it when you notice any unpleasant odor. It is very useful to have your cat come when you call, and all you have to do is provide a positive association with their name. Use it often when you are playing with them or petting them or putting food in their dish. When he or she comes or even looks up when you call their name, praise and reward them. To help your kitten learn to behave, there are a few simple things you can do to help socialize them. Socializing teaches him or her to be brave and independent. You can invite people over to meet your new kitten and let him or her play with other kittens. You can even let him or her play with a well-trained dog that has cats and kittens in their own household. If children visit, make sure they know what they can and can’t do around your kitten. Start taking him or her for car rides in a cat carrier. If he or she gets used to car travel early, they won’t associate the car or the carrier with going to the veterinarian or with you leaving them. Cats are crepuscular, which means that they are most active at dawn and dusk. You should consider this when selecting where your kitten is going to sleep, and making sure the location is safe so he or she can’t get into trouble. If your kitten starts scratching the furniture, put a scratching post near where he or she plays, rub it with catnip, and take him or her to it whenever she starts to scratch. To learn more about how we can help you to provide the best kitten care, visit our clinic at 3995 Hastings Street, Burnaby, BC, V5C 2H8; or phone: 604-291-6666.